Original photograph approximately 19 x 12cm. 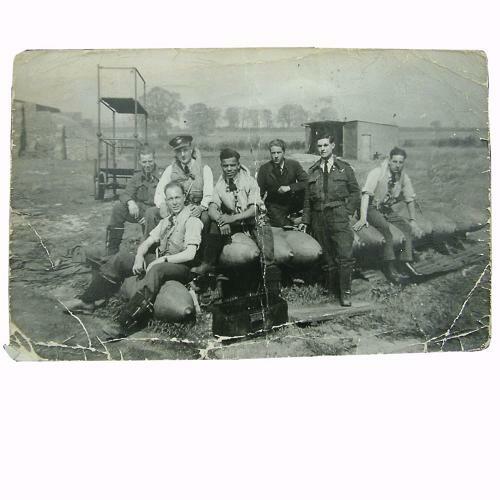 Shows 7 bomber crew sitting on some bombs on an airfield. They are wearing an assortment of kit including war service dress uniforms, 1941 pattern Mae Wests and 1940 and 1943 pattern flying boots. Interestingly and unusually, the chap in the centre is black. It seems that even today few people are aware of the important contribution made by 500 RAF aircrew recruited from the Caribbean and West Africa. Heavily creased and with dog-eared corners but a great image. Stock code P22873-114.